I have spent a lot of time dealing with a bout of pneumonia. Thankfully, I had a shining spot in what has been a bleak couple of weeks. I was initiated into Good Samaritan Tabernacle XXXVI, Holy Royal Arch Knight Templar Priests, at the Minnesota Masonic Heritage Center. 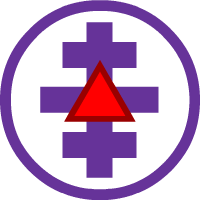 The Holy Royal Arch Knight Templar Priests in the United States is open by invitation to past commanders only. The degree set was first mentioned in the United States in 1829 in the state of Rhode Island. The modern degree, like so many degree sets, was fully formed by J. Ray Shute, II, a brother all AMD Companions will know. Membership in each tabernacle is restricted to 33 members. I want to thank Sir Knight Bruce and Sir Knight Ray for really presenting a great degree. The degree was extremely powerful and I really cannot wait to dive deeper into the symbolism. If you are ever given a chance to join this order, you must do it. I absolutely loved it.